THE CLINIC PERMITTED PAUL MANAFORT one 10-minute call each day. And each day, he would use it to ring his wife from Arizona, his voice often soaked in tears. “Apparently he sobs daily,” his daughter Andrea, then 29, texted a friend. During the spring of 2015, Manafort’s life had tipped into a deep trough. A few months earlier, he had intimated to his other daughter, Jessica, that suicide was a possibility. He would “be gone forever,” she texted Andrea. That's just the first paragraph. Read the whole thing. This is Pulitzer-worthy, and from the same guy who wrote the expose the Trump Tower/Alfa Bank server connection that everyone, excluding me, dismissed two weeks before the 2016 election. I haven't had an Atlantic subscription in at least a decade, but I may be about to change that. 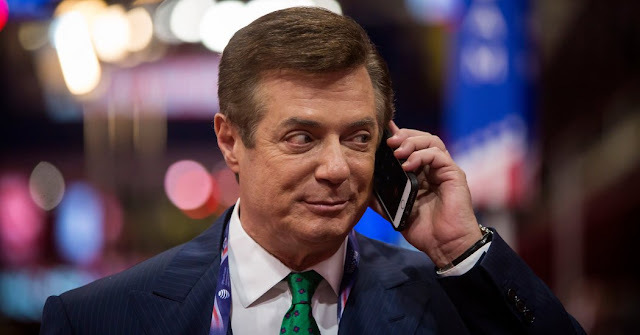 And I'll go out on a limb and predict that Manafort will die of unnatural causes either in prison or before he goes -- by his hand or by mysterious ones.